There has always been a choral tradition within the Dursley and Cam areas as is demonstrated by the number of musical outlets currently on offer there. 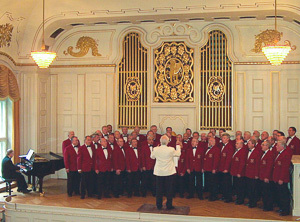 Male voice singing was prevalent during the 1950s when the Cam and District Male Voice Choir was formed. As with all good things in life, the Dursley Male Voice Choir was conceived in a pub in November, 1978 by two groups, co-incidentally both living in the same road on the Norman Hill Estate in Cam, but unknown to one another. Mike Evans (a Bank Manager) put a small advert in the Dursley Gazette asking if anyone was interested in starting a male voice choir. 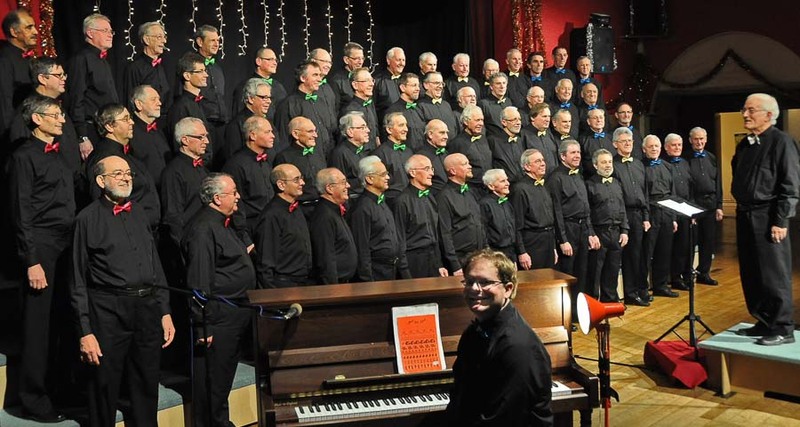 Meurig Lewis (a teacher at Rednock School) and Eric Davis (a Local Government Officer) had written to all the local organisations seeking support for the formation of a Dursley Male Voice Choir. When the Mike Evans advert was published, the two groups got together and met in the Berkeley Arms in Cam to agree a way forward. The date of an inaugural meeting was agreed and a room booked in the Community Centre in Dursley for 29th November, 1978 at 7.45pm. Prior to the inaugural meeting, the three instigators (above) held another pre-meeting in the Railway pub in Cam where they introduced themselves to Mr. Gerry Dance (Organist and Choirmaster of Upper Cam Church). After a discussion of ideas for the choir, Mr. Dance was invited to become the first Musical Director and in the first instance to double up as accompanist. Gerry Dance, Eric Davis, Mike Evans and Meurig Lewis. Brian Wetton and Ellis Williams, Founder Members, currently sing with the Choir. The first rehearsal of the Dursley Male Voice Choir took place in the Dursley Town Hall on Wednesday 13th December, 1978 where 21 members attended. The first music rehearsed was "Jacob's Ladder" followed by "Steal Away", "Serenade" from the Fair Maid of Perth by Bizet and finally "By Cool Siloam" an arrangement by Hugh Roberton of the hymn tune "Belmont". 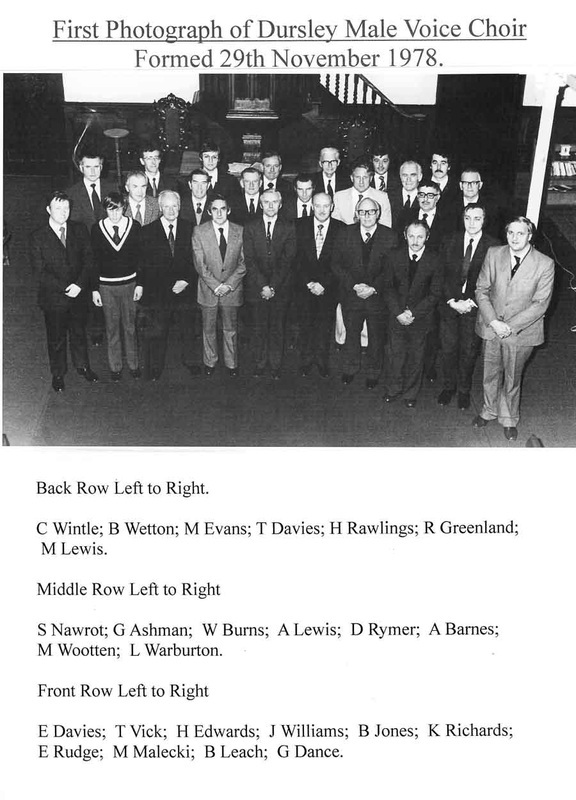 The members agreed to re-convene after Christmas on Wednesday, 3rd January, 1979 and the Choir was established. Mike Evans succeeded Gerry Dance in 1980 and when he moved to pastures new in 1991. Colin Lawrence, who was formerly with Côr Meibion Cwmbach in Glamorgan was appointed Musical Director in 1992. He held this position until his untimely death in 2002. At that point Barrie Cooper was appointed having been Accompanist for two years. It should also be noted that Wilf Burns acted as Deputy Musical Director for 15 years or so since the formation of the choir. Bernard Leach was Assistant Accompanist for Caldicot MVC and it was always intended that he would assume that role for DMVC but until he was free from his Caldicot commitment, Doris Lancaster agreed to hold the fort and play at rehearsals. Bernard actually took up his duties in 1979 and remained the Principal Accompanist until 1995. During that time he had two deputies. These were Gillian Ford who started with the choir at the age of 16 whilst she was still at school. When she left to go to music college, it was Kate Wilkins took over as deputy in 1994. She continued after Bernard Leach left the choir and served until Ian Whittle was appointed from 1996 to 2001. Barrie Cooper then served as Principal Accompanist until 2003 and as noted previously then became Musical Director. Paul Phillips, who had been a chorister served as Deputy Accompanist to Barrie from 2000 to 2003 and became his successor as Principal Accompanist from 2003 to 2010. Robert Burgess succeeded Paul in 2010 until 2017, when Paul returned as the principal accompanist. In 2018, following the death of Brian Parslow, Deputy Musical Director, Matthew Sharp was appointed as the Choir's Deputy Musical Director. By 1979 the choir membership had risen to 30 singers and tangible help in the form of sheet music had been provided by Caldicott MVC. A joint concert was held by the two choirs in the summer. Regular practices were by then being held in Methodist Church Schoolroom. The choir grew steadily through the decade numbering 40 in 1980 to 60 in 1983 and then over 70 in 1988. Through the next two decades the peak size was reached at almost 100 choristers. A single Annual Concert was held in the early years the venue being the Sports Hall of Rednock School which meant a huge amount of work needed to be accomplished to turn the venue into a Concert Hall. Tarpaulin had to be laid on the floor and chairs carried from 100 m away – all to be removed by 10 a.m. the morning after the concert. ​Eric Davies, the Hon. 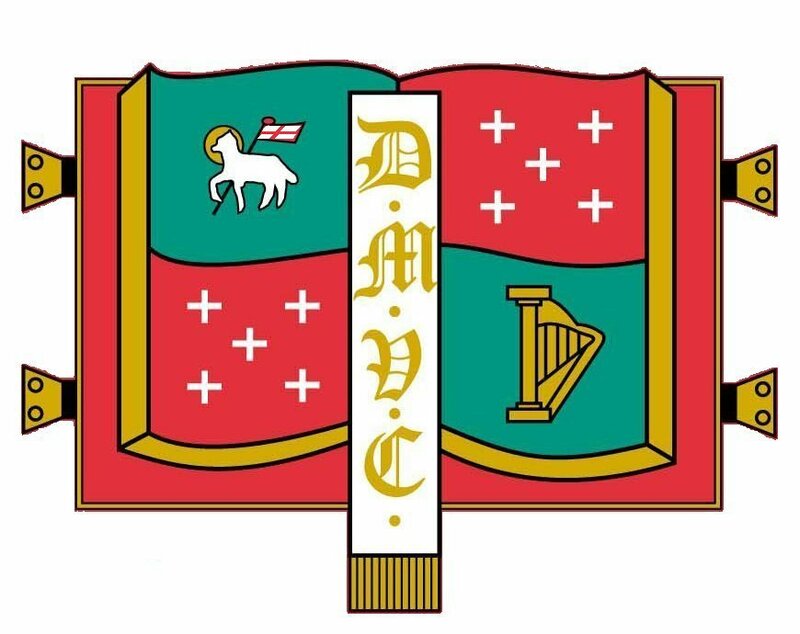 Secretary, presumably at the request of the Committee, approached the College of Arms in February 1979 with the proposal that the choir should adopt the Coat of Arms for the Dursley Rural District Council, issued under the Earl Marshall’s warrant of 27th December 1951 as it sought to obtain a distinctive identifying motif. This logo had been in use until 1974, when under Government reorganisation the Dursley Council became part of the new Stroud District Council, with the logo becoming redundant. ​The advice from the College of Arms was that this proposal was contrary to the Law of Arms for Armorial Bearings and it could not be adopted for use. However there was no objection to some of the symbols being drawn from the Arms of Dursley R.D.C. for use in a choir motif particularly if those chosen could typify Dursley and the area. It was noted that it would not be proper for the devices to be placed upon a shield depicted as a crest. Noting these comments, a design was then submitted for comment with the following supportive notes. The motif was based on an open bible depicting the translation into English by William Tyndale, who was born in the district. In the quartered panels, the lamb represented the importance of Dursley, over the generations, as the centre of the Gloucestershire wool industry and the white crosses were symbolic of the parishes of the district. The harp contained in the final panel showed the choir’s wish to represent the great interest shown in the area for music of all kinds. In response, the College of Arms correspondent made various recommendations. He thought that the design was ingenious but that at a distance or quick glance, could be taken for a Coat of Arms – which it could not be. Constructively it was suggested that clasps could be added to each side, such as a Tyndale bible might have had and the placing of a central vertical bookmark including ‘D M V C’ would counter the above criticism. The design was applauded on a personal basis but it was made clear that this was not in any way formal approval from the Garter King of Arms. The suggestions were accepted fully and hence the motif that you all know was born! The first award arrived in 1981 with a win at the Mid-Somerset Competition Festival held in Bath. That same year the accolade ‘Best Choir’ was awarded at the Cheltenham Music Festival as it was in a competition in the Forest of Dean. Throughout its history the choir enjoyed a number of successes in Cheltenham well into the 21st century. A longer journey was also made to a national competition in Blackpool that same year and against some outstanding choirs Dursley Male Voice Choir gained a creditable fourth position from 12 choirs. 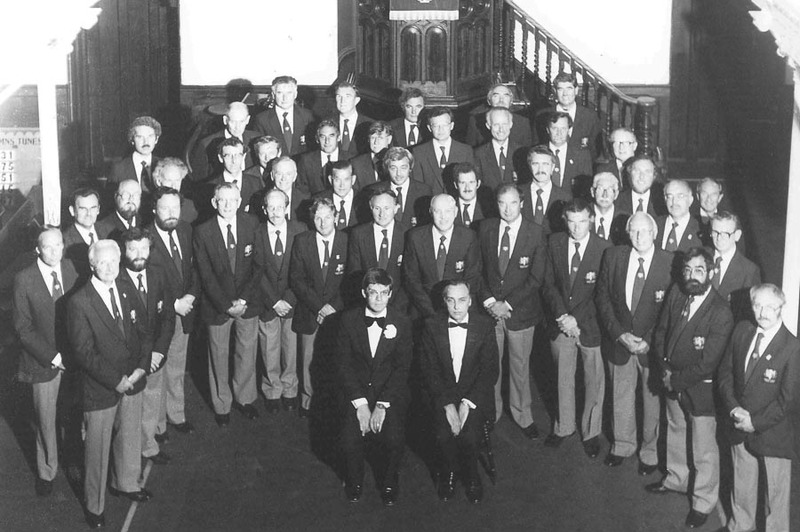 The choir has achieved notable success in several competitions on the BBC and HTV in 1982/3/4 and 1986, including being semi–finalists in the BBC Male Voice Choir Choir of the Year competition. Successes also followed in competitions in Cornwall (1990) and to some measure in Huddersfield (1991) First place was also gained in the prestigious Miners’ Eisteddfod in Porthcawl in 1996. More recently in 2009 the choir was awarded third place in the Cornwall International Music Festival against strong competition. The Choir performs between 12 and 15 concerts each year, the majority of them for charity. Memorable concerts including those in Ireland as visitors to the Cork Festival and in Germany when competing at the Harmonic Festival Limburg were highlights. The choir has performed with bands of The Grenadier Guards, The Royal Marines and The Army Air Corps in Gloucester Cathedral and Cheltenham Town Hall. 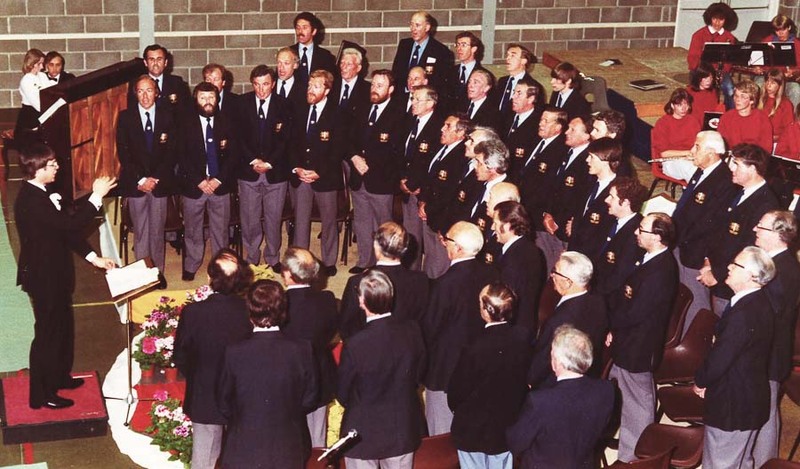 In 1988 the St. Lubentius Choir from Germany were visitors and took part in a joint concert. Two years later the Tranemokoren Choir from Sweden were hosted by the choir and then in 2001 the choir and the town of Dursley hosted the Yokohama National University Old Boys Glee Club from Japan at a joint concert in the town. Their visit was part of the Japan 2001 Festival to celebrate the arts and culture of Japan under the patronage of HRH The Prince of Wales and the Crown Prince of Japan. Our visitors from Japan made a CD including the music from all their joint concerts which is now being distributed in Japan. "...Praise must be given to the Dursley Male Voice Choir for their excellent diction. Every word was clearly understood. Their attention to detail in dynamic control, their tuning and their ability to focus on their conductor, Barrie Cooper, were outstanding. Their delicious sounds and soft lilting tone, which they contrasted with dynamic singing when required, together with the poise that emerged in 'Let it be Me', marks this choir out as a gem of Gloucestershire music..."
At Christmas in 2003 the choir celebrated its Silver Jubilee with a concert of Seasonal music at home in Dursley. 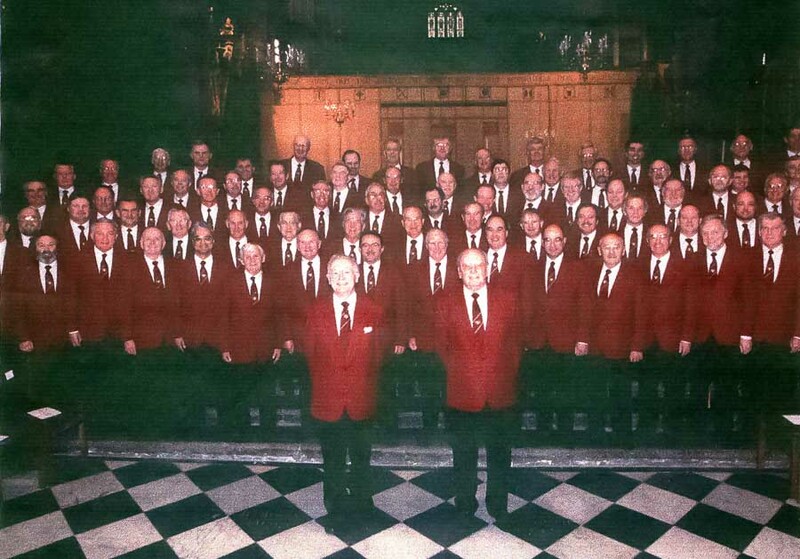 In October 2004, the Choir joined 800 Choristers for an outstanding concert in The London Welsh Male Voice Festival at The Royal Albert Hall, London. The following year Dursley Male Voice Choir hosted the National Male Voice Choir of New Zealand and another memorable joint concert was presented. One of the guest singers at the Albert Hall in 2004 was Wynne Evans, the very talented operatic tenor and he was the Guest Soloist of the Choir at The Cheltenham Town Hall in March 2013. This major event supported ‘Hope for Tomorrow’, a national charity dedicated to bringing cancer treatment closer to home. Their mobile chemotherapy unit brings vital treatment close to patients’ homes so reducing the need for long distance travel, waiting times, and the stresses and strains of busy Oncology Centres.